A deduction is also allowed under section 16(ii) in respect of any allowance in the nature of an entertainment allowance specifically granted by an employer to the assessee, who is in receipt of a salary from the Government, a sum equal to onefifth of his salary(exclusive of any allowance, benefit or other perquisite) or five thousand rupees whichever is less. No deduction on account of entertainment allowance is available to non-government employees. 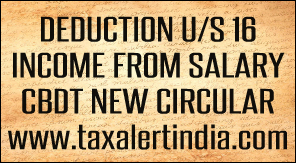 The tax on employment (Professional Tax) within the meaning of article 276(2) of the Constitution of India, leviable by or under any law, shall also be allowed as a deduction in computing the income under the head "Salaries".